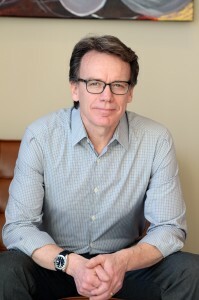 Born and raised in southwestern Saskatchewan, Perry moved to Saskatoon in 1980 and over the next several years completed Bachelor’s Degrees in Psychology (1983) and Physical Therapy (1988). He began as a practicing Orthopaedic Physiotherapist in 1988 and has continued until present day. Along the way he completed his Master’s Degree in Rehabilitation Science at Queens University (1994). In 1994 Perry, along with his partner, Katherine Daniels, launched Daniels Kimber Physiotherapy Clinic in Saskatoon. He spent the following years in clinical practice and clinic management. Daniels Kimber became one of the largest clinics in Canada combining great customer service with high quality therapies. The Daniels Kimber clinic was eventually sold to LifeMark Health. Besides clinical practice Perry was also involved with the School of Physical Therapy, University of Saskatchewan where he spent 17 years as a clinical instructor. He continues to be a passionate proponent of the School of Physical Therapy and its students. Presently, Perry is a Partner and therapist with Nomad Therapies. As a clinical therapist, Perry’s focus continues to be orthopaedics. His clientele includes people of all ages with a vast assortment of injuries and conditions. Perry is a registered physiotherapist, licensed to practice in Saskatchewan.